A recent review of Internet usage and trends in 2010 revealed that (*gasp*) media uploads to social media sites are HUGE. On average, 3 billion photos were uploaded to Facebook every month in 2010. Staggering! While Facebook's numbers are certainly impressive, let's not overlook photo-sharing powerhouse Flickr and its ability to help you market your business online. New to Flickr? Here are some tips to getting started. Let’s start with the basics of any social media site: your profile. Make your Flickr profile name your company name or, even better, your company URL. While you’re at it, use your profile page to mention your location, a brief bio of your company, and any other information relevant to your customers. And don’t forget your avatar! Ideally, this would be your company logo … just make sure it’s not a completely irrelevant photo (e.g. your grandchild or a close-up of your dog wearing a funny hat ... cute, but not relevant). There’s a reason Facebook beats out Flickr in the number of photo uploads. For starters, Facebook has easily ten times more users than Flickr. 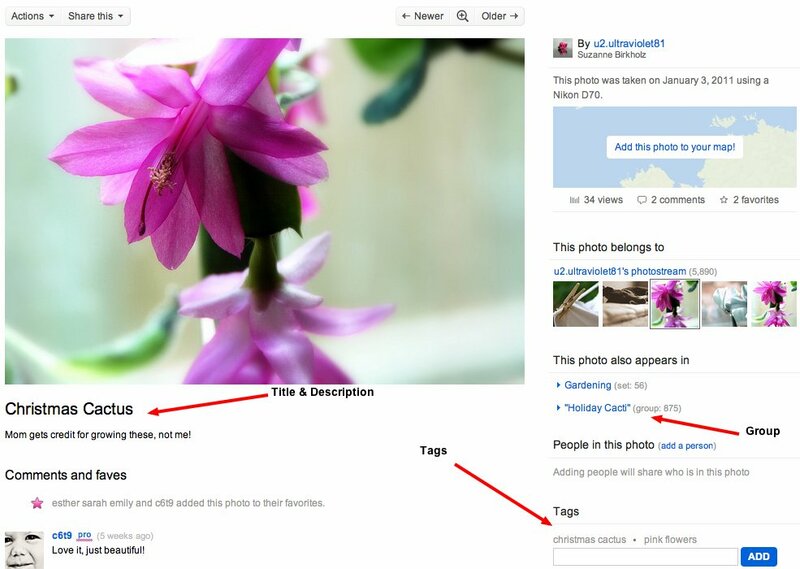 Also, think about the context of the photos uploaded to Facebook versus Flickr. People upload photos to Facebook to show off pics of their latest parties, their new cars, and their kids’ dance recitals. These are not necessarily photos that have been taken with pricey SLR cameras. In contrast, you’re more likely to find pics on Flickr from photography enthusiasts (both professional and amateur) who are more concerned about the quality of the photos than just their content. With that in mind, when deciding what type of photos (and videos) to upload to Flickr, it’s important to not overlook quality. While we’re not all Anton Corbijn (or, insert your own favorite photographer here), we still need to be cognizant of the fact that our customers (and potential ones) will be viewing what we upload, and, therefore, we need to put our best foot forward. If your hope is to be found by Flickrites via search, you must include a title and a description for your image. You don’t need to link to your web site from every photo nor do you need to attempt to sell potential customers from a Flickr photo page. You just need to let people know what they’re looking at, and, hopefully, your images and what they represent will do the selling for you. And don’t forget to tag your photos! Rather than shoving every applicable keyword into your title and description, utilize tags to target additional keywords you’d like your photos to be associated with. As we alluded to above, Flickr’s primary purpose is to attract photo enthusiasts interested in sharing photos, learning photography techniques, and being inspired. You will therefore find numerous Flickr groups whose purpose is to unite like-minded Flickr users with various interests. For example, if gardening is your hobby, you could join any number of groups dedicated to botany or edible gardening. If you love baking, you could find groups that share recipes and images of the group's users’ favorite sweets. Likewise, identify groups relevant to your business’s particular industry. Maybe you repair and restore vintage automobiles and could join similar-themed groups to share photos of your recent work. Flickr groups are a great way to network, get ideas, and, hopefully, gain some new customers! Most of all, Flickr is about sharing and having fun. Flickr users share photos, because they love photography and enjoy conversing with others who feel the same way. So, stay consistent with Flickr: upload quality photos, upload frequently, and join in discussions. You never know - one of your Flickr friends may just become your next customer!